Within the past year, owing to the extensions of the Great Eastern Railway premises at Bishopsgate Street, an old house of antiquarian interest was pulled down, and generously presented by the Company to the South Kensington Museum. It will shortly be arranged so as to enable the visitor to see a good example of the exterior as well as some of the interior woodwork of a quaint house of the middle of the seventeenth century. This was the residence of Sir Paul Pindar, diplomatist, during the time of Charles I., and it contained a carved oak chimney-piece, with some other good ornamental woodwork of this period. The quaint and richly-carved chimney-piece, which was dated 1600, and other decorative work, was removed early in the present century, when the possessors of that time were making "improvements." In the illustration of a child's chair, which is said to have been actually used by Cromwell, can be seen an example of carved oak of this time; it was lent to the writer by its present owner, in whose family it was an heirloom since one of his ancestors married the Protector's daughter. The ornament has no particular style, and it may be taken for granted that the period of the Commonwealth was not marked by any progress in decorative art. The above illustration, however, proves that there were exceptions to the prevalent Puritan objection to figure ornament. In one of Mrs. S.C. Hall's papers, "Pilgrimages to English Shrines," contributed in 1849 to "The Art Journal," she describes the interior of the house which was built for Bridget, the Protector's daughter, who married General Ireton. 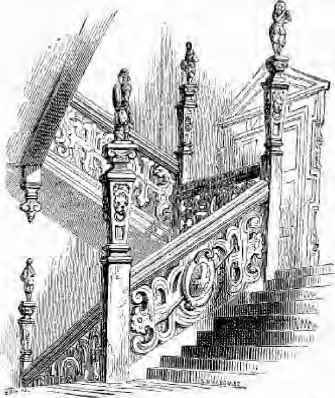 The handsome oak staircase had the newels surmounted by carved figures, representing different grades of men in the General's army—a captain, common soldier, piper, drummer, etc, etc., while the spaces between the balustrades were filled in with devices emblematical of warfare, the ceiling being decorated in the fashion of the period. At the time Mrs. Hall wrote, the house bore Cromwell's name and the date 1630. We may date from the Commonwealth the more general use of chairs; people sat as they chose, and no longer regarded the chair as the lord's place. A style of chair, which we still recognise as Cromwellian, was also largely imported from Holland about this time—plain square backs and seats covered with brown leather, studded with brass nails. The legs, which are now generally turned with a spiral twist, were in Cromwell's time plain and simple. France, Spain, and Portugal; and our craftsmen profited by new ideas and new patterns, and what was of equal consequence, an increased demand for decorative articles of furniture. The King of Portugal had ceded Bombay, one of the Portuguese Indian stations, to the new Queen, and there is a chair of this Indo-Portuguese work, carved in ebony, now in the museum at Oxford, which was given by Charles II. either to Elias Ashmole or to Evelyn: the illustration on the next page shews all the details of the carving. 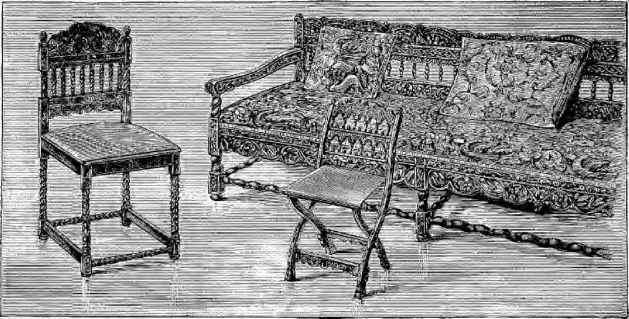 Another woodcut, on a smaller scale, represents a similar chair grouped with a settee of a like design, together with a small folding chair which Mr. G.T. Robinson, in his article on "Seats," has described as Italian, but which we take the liberty of pronouncing Flemish, judging by one now in the South Kensington Museum. In connection with this Indo-Portuguese furniture, it would seem that spiral turning became known and fashionable in England during the reign of Charles II., and in some chairs of English make, which have come under the writer's notice, the legs have been carved to imitate the effect of spiral turning—an amount of superfluous labour which would scarcely have been incurred, but for the fact that the country house-carpenter of this time had an imported model, which he copied, without knowing how to produce by the lathe the effect which had just come into fashion. 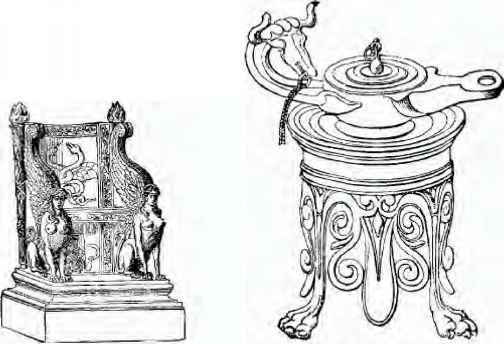 There are, too, in some illustrations in "Shaw's Ancient Furniture," some lamp-holders, in which this spiral turning is overdone, as is generally the case when any particular kind of ornament comes into vogue.